I mentioned that I'd bought this a few weeks ago in a mini haul, and started reading it earlier this week. BBC made a mini drama series adapted from the book earlier this year and I was absolutely gutted to have missed it! I've looked for the adaptation online since but never found it, so seeing the book in a charity shop was a great find for me. I didn't know much about the story before I started reading, so I started out blind but from the outset you definitely know Birdsong is a story of love, pain and war. Part 1 is set in Amiens, Paris in 1910, (romantic already, non?) 20-something year old Stephen Wraysford is staying with the family of factory owner, Azaire. He has been sent from a fabrics factory where he works in England to find out more about the suppliers, one of which is Azaire. While staying at the house Stephen begins to feel drawn to Azaire's wife Isabelle, who is much younger than her husband. After spending a short amount of time alone, Stephen is beginning to feel more than curiosity towards Isabelle and delays returning home to London to be in her company. The two start a hasty affair culminating in them leaving Azaire's house and going away to St-Remy in Paris to start a life together. Circumstances change and in Part 2 we are in the year 1916, where the world is rife with warfare. We meet a new character, Jack Firebrace, a pre war minor and now a tunneller for the British armed forces. Jack's captain, Weir is a good friend of infantry captain Stephen Wraysford, who has found himself in battle since part 1. Stephen is a rather lost soul, though a strong soldier. Throughout the rest of the novel we see the unbelievable plight of war and the effect it had on not only the soldiers who's lives were ended, but those who fought alongside them and survived. Later in the novel we are introduced to a new character, Elizabeth. Elizabeth's parts of the novel take place in the 1970's where she is looking to find out information about her grandfather, who fought in the war, and we see a stark contrast between past and present, as a younger generation struggles to understand the horrors of what had befallen their pre-predecessors'. I absolutely loved this novel. There is a quote on the back of my copy written by Andrew James of The Sunday Express which reads: "This book is so powerful that as I finished it, I turned to the front to start again" And I'll admit I was tempted. This is one of those books that really hits you and at times you have to stop reading and go back a few paragraphs to absorb what's written; because nothing is just said to fill up the pages, every word seems so full of meaning, but you never get the feeling that the author is forcing sympathy, he is very matter of fact with his writing choices which are both powerful and respectful, and leave you with a strong sense of contemplation. "He found the word Jesus in his mouth. He said it again and again beneath his breath. It was part prayer, part profanity. Jesus, Jesus...This was the worst; nothing had been like this." It's 2012 now and this war was ended almost 94 years ago, meaning that all of the men who fought in the war written about in Birdsong are now gone. All that is left are these accounts, some written from memory and some from imagination but the message is still clear; we must not forget. Some of the events written about in this novel are very hard to read, including the Battle Of The Somme as a military example and Elizabeth's visit to a soldier as a post war example. The man Elizabeth visits has had a leg amputated due to a shelling, and has been living in a care home since the war, his mind is gone along with his awareness and has had no visitors since his sister died some twenty years previous. These parts were almost harder for me to read then the parts of ravaging warfare because we see in this novel all of these men dying and observing death, dreaming of home, only to get there finally and find themselves forgotten - unwanted reminders of a best forgotten time. We seem to treat those in later stages of life to us now as inconveniences and I cannot understand why. These are people who have lived through times harder than we can ever imagine. Yes, the soldiers who fought in this war themselves are now gone, but what about their children and grandchildren? Those who grew up amidst the chaos of war? Who perhaps fought themselves some twenty years later in the second World War? What about the women who adapted to work and loss while bringing up families in terrible conditions? Those people are still with us and we ignore them, we push them away and put them into care homes so that they don't hinder our lives, we have lost respect for generations who payed in blood and life to ensure freedom for our countries and our thanks are to push them aside. The ending of this novel however leaves us with hope that these lost lives are remembered in some way and that the stories of family and novels such as this one will continue to tell future generations of the past. It's a horribly reflective way to feel but these are the emotions I'm left with after reading this novel. It is a beautifully written memoir on the generations we will never know and I think it's a book I'll turn back to many times. 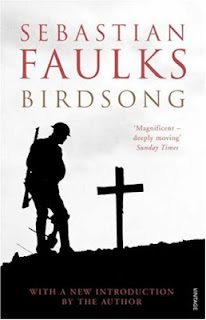 Faulks, who writes this tale beautifully has written two other novels which have connecting characters to Birdsong; The Girl At The Lion d'Or and Charlotte Grey, which I'll definitely be picking up. 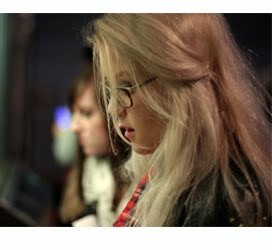 This is the first I've heard of this one. Sounds like a great read -- I'll have to check it out! The adaptation was the first I'd heard of it too, but it's really excellent - please do! Sounds awesome, and your review really does it justice. I found you via the liebster award and became a follower, nice to meet you!